It seems that recently, more than ever, people are becoming more conscious of what they’re putting in their bodies. There has been a massive nutritional awakening on the ever-growing number of “healthy” labels on grocery store shelves. Products displayed as “natural,” “organic,” “low-fat,” “made with real ingredients,” and “no sugar added” have been hot sellers, as marketing companies look to take advantage of a consumer base that might be more informed than ever … or one might think. But, many items in grocery stores contain deceptive food labels. Many of the items boasting the labels mentioned above could be very unhealthy while creating a false and potentially dangerous sense of security. After all, is an organic cookie made with all the sugars in a regular cookie that much better for you than a regular cookie? Is a chocolate bar made with “all-natural” ingredients a health food? After all, the last time I checked, sugars and fats (other than trans-fats) are 100% natural. Deceptive foods labels and the gags in the grocery store hit you from every angle like it was a Halloween funhouse. Food companies attract consumers by using reassuring keywords and buzzwords so that you buy their products, ultimately under the disguise of making healthy choices. But, don’t get duped. Just like the programming on your television, the music on your radio, the clothes on your back, and the shoes on your feet, food is subjected to trends. It’s why every year or two, a new food is anointed as a superfood while another is wiped out from your memory, and certain flavors, ingredients or buzzwords come into style. Buying a cake made with “real ingredients” doesn’t make a cake healthy. After all, sugar is a real ingredient. So is icing sugar. And, hey, so is butter. Now it might be hard to argue that butter is necessarily an unhealthy food, but the amount used to make your cake sure is. So, at the end of the day, an item made with “real ingredients” isn’t saying much. And what, I wonder, would qualify as a “fake” ingredient? If it’s in there, it’s a “real” ingredient. And, what about products marketed as “low-fat?” Sure, fat has been vilified for years as a dietary no-no, but is it as unhealthy as flavor alternatives like sugar? Definitely not. In fact, there is a link between increased sugar intake (which was used to replace the flavor in “low-fat”) and obesity, as well as type 2 diabetes. 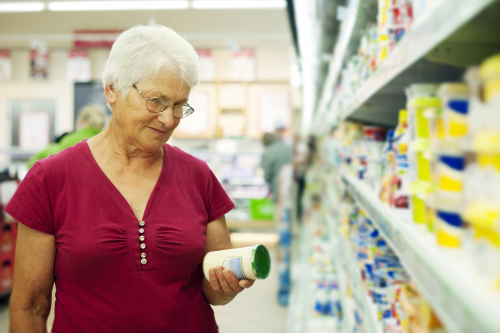 The perception of healthy labeling is much different than healthy eating. Thankfully, if you know what you’re looking for, you don’t have to fall victim to the deceptive labels on food items. Here are a few of the common ways companies can mislead you with their products, and what to look for. These are what I would call the “weapons of mass distraction” when it comes to food labels. These words can serve as a ploy to distract you from what else is in the product, and usually in high amounts. A fruit juice that’s “made with real fruit” doesn’t mean it’s not sugar-laden or additive-free, nor does it lend any information as to how much real fruit might be in there. By peaking at the ingredients list, if you see sugar and about five things before any real fruits, the product is not what you think it is. Heck, it might even be a real fruit extract! Whole grains are another area where this can play a major part. A product labeled as “whole grains” may contain mostly stripped grains with a few whole grains thrown in. There is no minimum requirement to make such a claim. To make sure you’re getting real whole grains, read the label and check if it says 100% whole grains or if the package has a seal of approval from the Whole Grains Council. In all honesty, I’m not even entirely sure how this can be construed as healthy, but it’s a major buzzword associated with a healthy lifestyle these days. However, the reality is that there is no clear definition of what it means to the Food and Drug Administration (FDA), and therefore is not an indicator of any healthy or healthful attributes. Thus far, the only real rule-breaker would be to have any color additives in the product. Other than that, food companies can put whatever they like on the label. Furthermore, natural products are not healthy by definition (i.e., sugar). Sure, organic foods might be limited in pesticides and free of genetic modification, but does that make them healthy? Not necessarily. Take, for example, the organic cookie. In 2011, Cornell University compared the perception of two identical cookies, labeling one organic and the other regular. Participants who ate the cookie regarded the organic options as tastier, lower in fat, more nutrient-dense, and lower in calories than the “regular” one. But, both cookies were the same. The study showed how the organic label offers false relief. And, at the end of the day, organic and “regular” ingredients all have the same number of calories. Furthermore, if you’re on a budget, organic items probably aren’t worth the cost. Organic foods have no more nutrition than traditionally farmed foods. And, if you run fruits and veggies under water for 30 seconds or so, you’ll be removing the pesticides. Now, this is a really big one. You might see a label on a box exclaiming “120 calories per serving” and say, “Man, that’s great.” You go home, snack until you’re full, and think you’ve made a smart decision. However, as the weeks go on you’re not dropping any weight. Well, a serving size could be a tablespoon, one cookie, or five chips. At the end of the day, hitting that serving size is virtually impossible. Finding out the serving size is essential to making healthy choices to fit your lifestyle. If you want to avoid the deception, planning your trips to the grocery store is essential. The most important things you can do include making a grocery list using fresh ingredients and sticking to the perimeter of the grocery store. Most grocery stores have their unprocessed, fresh items along the perimeter, which is where you’ll find fresh produce, dairy, and meat that are free of any additives. Here are two other ways to protect yourself from deceptive foods. When you’re in the aisles, don’t look at the labels. Instead, look for keywords like “100% whole grains” or the Whole Grains Council seal of approval. Also, certain frozen items, particularly fruits and vegetables, are safe to eat. Just make sure that the only contents of the bag are what is on the label and that it doesn’t contain added sugars. Reading labels is extremely important. Aside from learning the serving size, you can check how much sugar is in each serving and what the ingredients are. The fewer ingredients, the better. Also, beware of words ending in “ose,” which are just other forms of sugar. “American Adults are Choosing Healthier Foods, Consuming Healthier Diets,” U.S. Department of Agriculture, January 16, 2014; https://www.usda.gov/media/press-releases/2014/01/16/american-adults-are-choosing-healthier-foods-consuming-healthier, last accessed May 1, 2017. “Health halo effect: Don’t judge a food by its organic label,” Science Daily, April 11, 2011; https://www.sciencedaily.com/releases/2011/04/110410130831.htm, last accessed May 1, 2017. “Organic labels bias consumers perceptions through the ‘health halo effect,’” Science Daily, April 1, 2013; https://www.sciencedaily.com/releases/2013/04/130401121506.htm, last accessed May 1, 2017.